Please note that we no longer sell these games boxes. 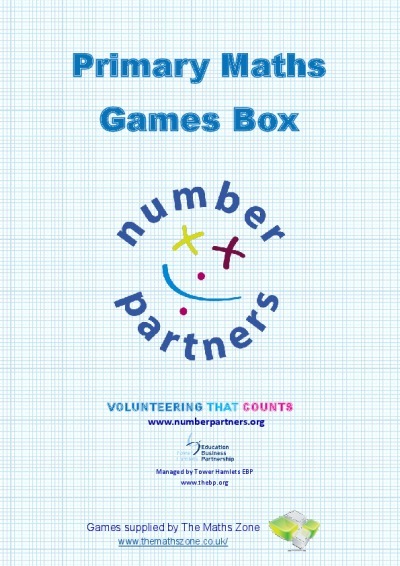 Number Partners is a national volunteer programme supporting maths learning in schools by linking volunteers with schools. The Maths Zone is delighted to be the main supplier of games and puzzles to this programme. Whether you are looking for a complete box of games to use with your volunteers in regular sessions in schools or are looking for resources to run a Tournament or a Maths Day, we can provide you with excellent resources and advice. This is the original Number Partners games box and consists of 12 board games arranged in 3 sets. It is designed for children of different ages or stages of mathematical learning. Each game supports a key learning objective, including properties of numbers to 98; doubling and halving to 40; the 3, 5, 6 and 7 times table. Maths for a Day is a complete event kit for organisations to use in schools to run a whole day of maths. If you have schools which can't commit to a full programme of support or you want to put on an exciting day at the beginning or end of a programme of support, we can supply you with a Maths for a Day box. Get in touch if you would like to run a Maths Day and we will support you to put it togehter. Why not get some 24® Game cards to use as part of your offer to schools. The Add / Subtract set is a fantastic way to develop early number skills in a fun way. And the real beauty of these resources is that you can use them as a five minute starter or to finish the session off. Or you can use them for the whole lesson and even work towards having a mini Tournament amongst your schools. Also, we have the great SuperTMatik game which is perfect for practicing number facts. It is also ideal for tournaments, with the added bonus that students can work at their own level within the game, so everyone can compete and feel included. Target maths works in a similar way to the 24®Game but this time the target number is on the card. Now students are focussed on different combinations of numbers. This works well in tournament format as well. Finally if you have volunteers who are well qualified mathematicians who could work with gifted and talented mathematicains in schools, then they will love our Wondermaths (for upper Primary - KS2) and Illuminate (for middle secondary) course boxes. These are also ideal for STEMNET amabassadors.